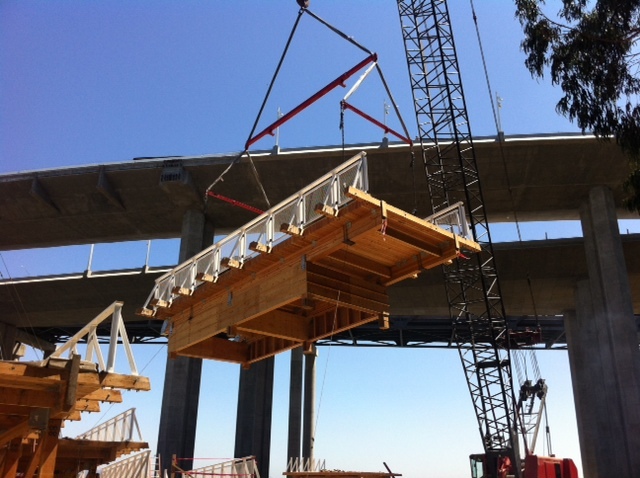 Construction crews lift a segment of a temporary section of the bike and pedestrian pathway from Yerba Buena Island onto the new eastern span of the Bay Bridge. With the new eastern span of the Bay Bridge opening in less than two weeks, bridge officials today highlighted the bike and pedestrian path that will be part of the new structure. The path, the first of its kind on either span of the Bay Bridge, will open sometime shortly after the new eastern span opens to vehicle traffic on Sept. 3, bridge spokesman Andrew Gordon said. Gordon and other Caltrans officials took media members on a tour this afternoon of the construction site on Yerba Buena Island underneath the new span, where construction crews were lifting segments of a temporary 650-foot section of the bike and pedestrian path onto the bridge. The temporary section will be installed during the extended closure of the bridge that begins next Wednesday at 8 p.m. and will replace part of the westbound approach to the old eastern span that is being demolished, Gordon said. It will connect to the new span’s permanent bike pathway, which is expected to be completed and connected to Treasure Island by late 2014 or early 2015 after the old bridge is taken apart and removed, according to Gordon. In the meantime, bicyclists and pedestrians will have to turn around after going about two-thirds of the way across the new eastern span while the construction work continues, Gordon said. The pathway will be 15.5 feet wide and have three lanes—one for pedestrians, one for westbound bicyclists and one for eastbound ones, he said. The bridge pathway will link to trails toward Maritime Street in West Oakland and Shellmound Street in Emeryville and will feature lookout points “where people can catch their breath or take in the view,” Gordon said. The California Highway Patrol will be patrolling the bridge on bicycles to ensure that all traffic laws are followed on the new pathway, CHP Officer Daniel Hill said. Bicyclists on the path could particularly pick up speed headed east on a 2 percent downhill grade back toward the East Bay and are subject to a 15 mph speed limit, Hill said. “We want to make sure people have equal access to the bridge,” he said. Skateboards and skates are not permitted on the pathway, which will be open from sunrise to sunset until further notice, bridge officials said. Gordon said he expects large crowds to go on the bridge when the pathway opens, which he said could come as soon as hours after the bridge opens to vehicular traffic after the Labor Day holiday weekend. More information about the pathway and the new eastern span can be found online at baybridgeinfo.org.